OK, we admit it. We’re suckers for Cupid’s holiday. Hearts, flowers and pink… What’s not to love? 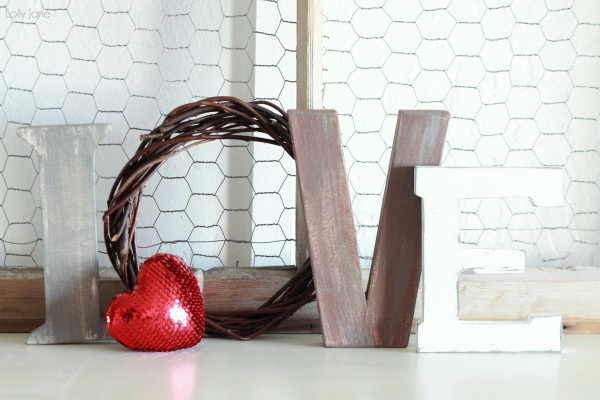 Here are seven Valentine’s decoration ideas to get you in the mood (for decorating, that is). While every woman deserves to have the perfect shade of red lipstick for Valentine’s Day, sometimes you have to work your way through a bunch of colors to find the one that works for you. Put all of those random tubes of lipstick to work! This adorable DIY lipstick art spotted on I Heart Nap Time is so easy even a novice DIYer can manage it in under an hour. Bonus: You can simultaneously clean out your makeup drawer! Nothing says Valentine’s Day like a bouquet of roses. Get the biggest bang for your buck by breaking up a bouquet and spreading out the stems in several different containers. 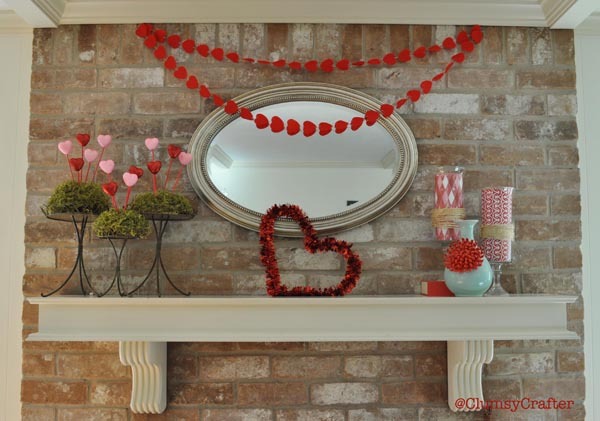 This lovely Valentine’s Day mantel on Craftberry Bush can be easily recreated with roses, books, silver containers and candles — most of which you probably already have lying around the house. Photographer Stacey Morris created this colorful heart mantel display with fabric scraps, but it could also be done with decorative card stock if sewing isn’t your thing. Skewers of varying heights placed in Mason jars keep the display from looking boring. You could also use different glass containers for even more variety. Morris was inspired by this picture on Pinterest. Got a sweet picture of your kiddos? 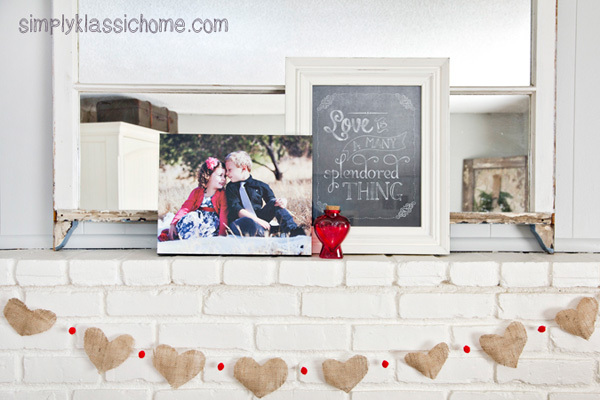 Use it as the focal point of your mantel like Kristin of Yellow Bliss Road did for her easy Valentine mantel. 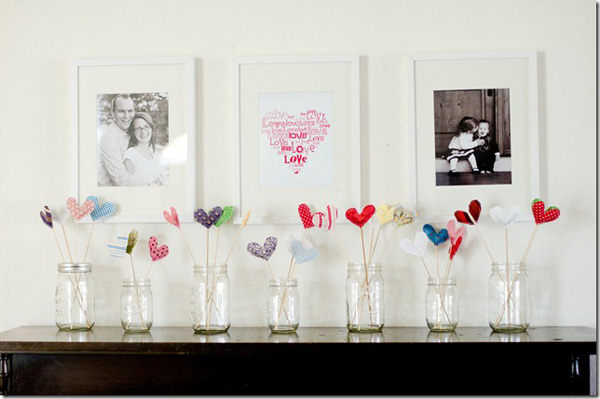 Print and frame her free Valentine chalkboard printable and add a simple garland to create the look at home. If your wallet is still recovering from the holiday season, try a visit to your local dollar store for affordable decor that won’t break the bank. 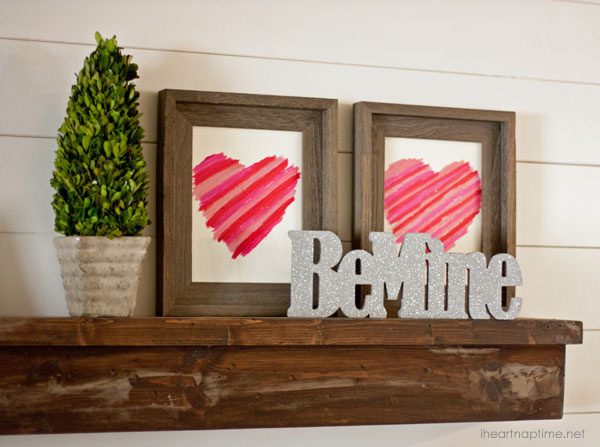 Blogger Bobbie Byrd of Clumsy Crafter made this Valentine’s Day mantel for just a few bucks. OK, we get it. You just took down your holiday decorations and the last thing you want to do is put up more. 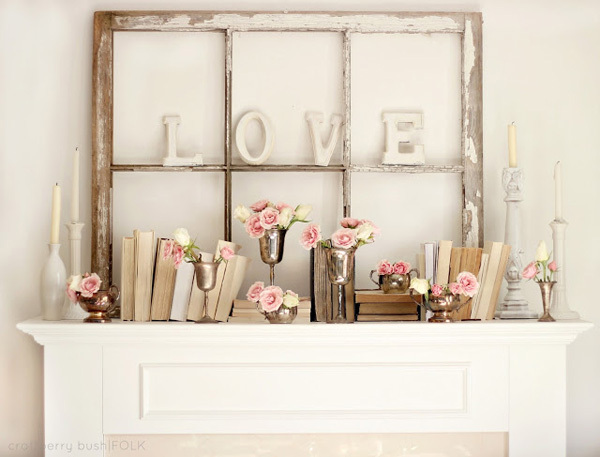 If you can relate, then this love letters mantel display is for you. Crafter Kelli over at Lolly Jane actually made these faux patina letters, but you could easily find some ready-made at a craft store. Neutral colors give the display staying power long past the holiday of love. 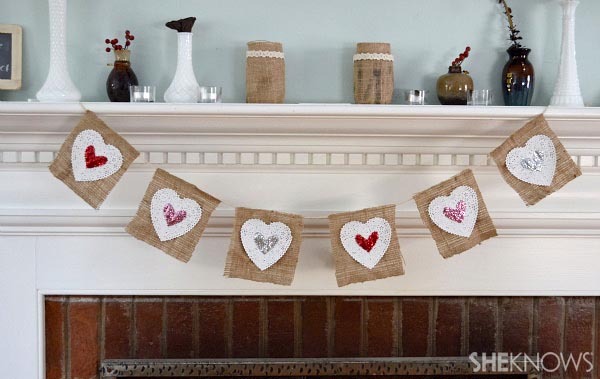 If you’re looking to get a little crafty with your Valentine’s decorations, try making our Valentine’s Day banner. The budget-friendly project costs less than $25 to make and uses common crafting goodies like burlap, glitter and glue.